Wild Apricot: Claire, could you tell us about advertising opportunities you offer and the revenue that comes in from sponsors? Claire Kerr Zlobin: Yes, we welcome advertising. We have a directory on the website so you can advertise directly. We also send out monthly newsletters, so if you have a product or service that is beneficial to our members and you want them to know about it, we give you the opportunity to let our members know about you. We work with the public health agency, Health Canada, and follow their ethical guidelines around marketing and advertising. We’re also partnered up with the Canadian Red Cross, so we have to follow their integrity guidelines. Because we work so hard to meet those guidelines, I think we’ve probably turned down $60,000 in advertising revenues. There are some companies that we just won’t accept money from. So basically after you’ve passed all of these guidelines, we have different sponsorship packages in place. You can either sponsor the whole program or you can sponsor an event like our golf tournament or our conference. You can also sponsor one of our support groups for around $1,500. We also allow sponsorship of some research projects and sell vendor tables at our events. Initially, I would just search online for people and organizations that had services or products that would benefit our members. So it was a lot of emailing, calling or going into a store and talking to them about what we do. Luckily for us now it’s gotten to the point where people are coming to us. We’ll get probably 10 plus emails a day of people who are interested in advertising with us on our directory or at an event. You have to put in the work and eventually it comes back around where people are reaching out to you because they value what you do. Our sponsors often recommend us to other sponsors. We understand you've also made use of government programs and grants? Yes we have. There are lots of grant opportunities but it’s really, really competitive. So it’s kind of like writing an essay – you have to do the research on what the guidelines are and what type of initiatives the granting agencies want you to carry out. It really depends on what you want to do and how well you align. So I think one of the best things to do is really just to research. There are regional grants, federal grants and grants through the HRSDC (now called ESDC - Employment and Social Development Canada). They have a granting program where you can hire students during the summer or hire newcomers who may need just work experience. That way you can have people that work on your project while they’re getting experience – and there’s some funding to cover that. I think some of the easier ones to get are the funding programs through the HRSDC. The federal grants and the municipal grants are harder to get because it’s really competitive. The other thing with grants is that they don’t provide core funding. They really do expect you to raise an equal amount to what they provide. They’re not going to ask you for the money back, but you have to have a sustainability plan in place as to how you’re going to manage if you don’t get the grant the next year, because nothing is guaranteed. Just because you get it one year doesn’t mean you’ll get it the next year – you’ll have to reapply. In 2009 when we received our first grant, that’s all the funding that we had. We needed that in order to grow, in order to develop the programs. Now that we’ve grown and we’re bigger and we have some other corporate sponsors, it’s not as crucial, but it’s still really important. In 2013 we didn’t receive any government funding and obviously we developed some fundraising strategies and luckily we were able to raise the funds ourselves. What strategy do you have around fundraising? What's been successful? Our fundraising strategy is one of the core strategic guidelines of the board. We are fortunate to have people on our board who really believe in the organization and have specific skills sets that can help us grow. We have an accountant, a marketing professional, a fundraising professional, an IT specialist and at one point, a lawyer. When you’re putting together your board it’s really important to have people that are going to be able to help the strategic growth. Our fundraising programs are always approved by the board. So whatever ideas we have, we need to have somebody who’s on the fundraising committee to try to help us see it through. Our first fundraising event was a small fun day and our goal for that was $5,000. That was successful – we reached our goals and our objectives. And then we learned from that and we held a large gala, and we learned from that and we moved on to a larger conference. We do have people who have event management experience in our organization as well and this year, we had our largest event ever – a golf tournament that raised $30,000. We needed this because we didn’t receive government funding this year. So we needed to raise money in order to continue the program. And because we had grown each year, our fundraising goals and our fundraising initiatives just kind of grew too. Your first fundraising event really has to be manageable so that you and your team succeed and then you can grow from there. So start small and slowly build up to something like a golf tournament. Can you give one or two key challenges that you’ve had in growing your organization to this point? For us it’s actually been a little bit of the reverse – our challenge has been managing the growth, since the organization has grown very fast. For example, I have five people right now who want to open a chapter in their community. But at the same time we have to make sure that we can really manage that growth. 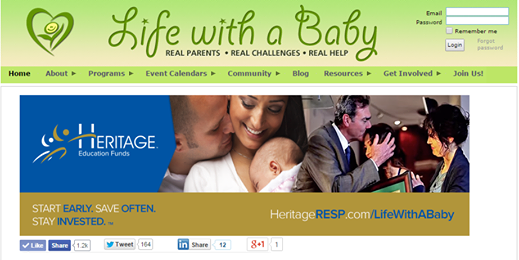 And as the founder and the executive director, you’re always so gung-ho – it’s kind of like this is your baby. And you want to grow it and then you realize that you've pushed yourself a little bit too hard and you have to roll back a bit. So for me it was just learning and understanding that just because we can, and it will be awesome, doesn’t mean that we should. We want to thank Claire Kerr Zlobin for speaking so candidly with us about how she founded and grew the Life With a Baby and Healthy Start, Healthy Future organizations. 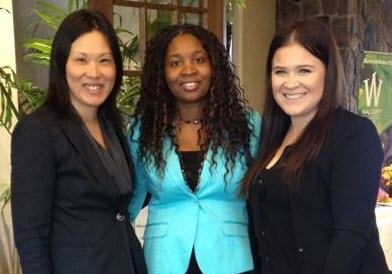 Photo: Claire Kerr Zlobin (middle) and two of her team members: Winnie Ng and Morgan McIndless.